Lychees or litchis are delicious, juicy, sweet and nutritious white berries. The love and romance fruit translated from Chinese is a gift for a joyful life. The outer slightly tough skin is red but the fruit is white. Lychees are full of Vitamins especially Vitamin C and antioxidants. It is rich in minerals like copper and potassium. The Chines believe that the fruit helps in relieving pain and reduces swelling of glands. My family loves lychees and how much ever I buy, it is never enough. When my kids were young, I had to actually count and share out the lychees between the 3 of them and God forbid if by mistake an extra one went into anyone’s bowl. Lychee juice was a popular drink during the very hot season. They are pretty expensive here as they either come from Israel or South Africa. I got the tail end lychees a few days ago. This means that they were a bit soft and if I would have left them for a day longer they would have started to turn brown. 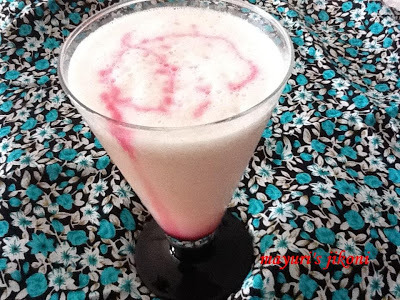 Since they were soft, I decided to make a thirst quenching and cooling drink with it. Peel the lychees. Make a slit on one side of the fruit and remove the seed. Put the lychees, water,salt and sugar in a food processor and process till you get a smooth mixture. Put a few ice cubes in the glass. Pour the juice over it. Slowly add the rose syrup to it and serve immediately. You need to strain the juice to remove any bits of tough brown covering of the seed that might get left on the fruit. Avoid sugar if the lychees are sweet. Freeze lychee juice in cubes. Add a cube or two to your water to get lychee flavoured water. 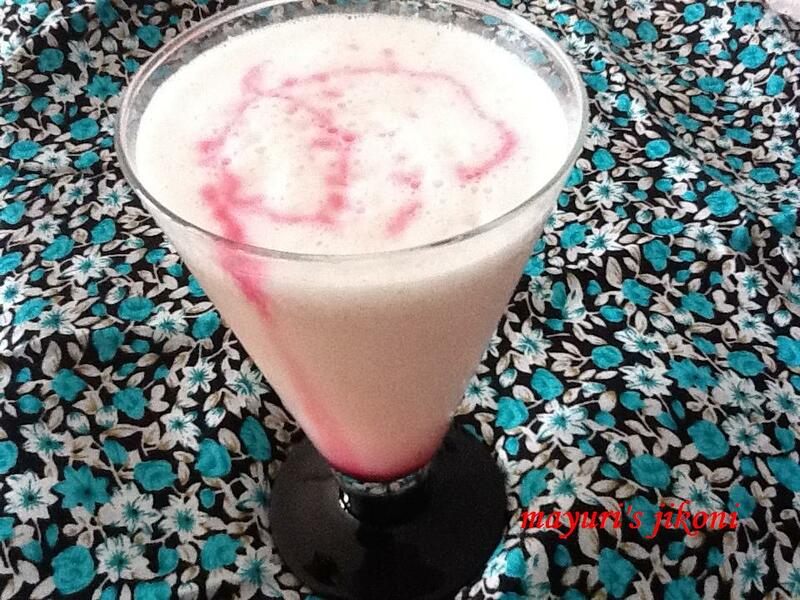 Super refreshing and lovely Mayuri… you have great collection of recipes in your space. Nice to know you, thanks for linking it to our wtml event. They must be refresh and I will to try to do if I have time. please make sure u follow the rules.